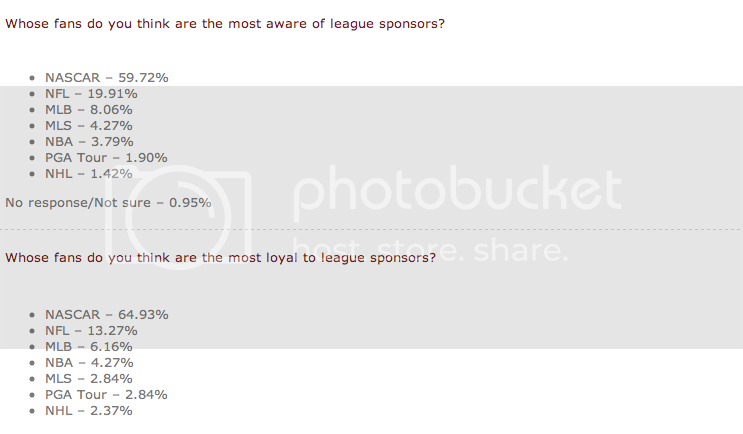 Want to know what kind of questions CMO's are asking about sports sponsorship these days? Here's a quick sample. Now of course, sponsor loyalty is an inexact science, but for the sake of discussion... Are fans still as passionate and loyal to NASCAR and its' sponsors as they once were? Is NASCAR still dominating in terms of both sponsor awareness and loyalty as this study from polling leader, Turnkey Sports & Entertainment, last year suggests? "North American-based companies will spend an estimated $3.3 billion in 2009 to sponsor motorsports teams, tracks and sanctioning bodies, down 5.7 percent from $3.5 billion last year," the first decline since 1985. But are there other issues, in addition to the oft used claim - motorsports' rising point of entry costs and a struggling economy? For many reasons (the consumer's wealth of entertainment options, entirely new sports and wider TV distribution to name a few), one might question whether any single entity will again reach NASCAR's previous levels of sponsor loyalty. The consumer's interests and loyalties are more fragmented than ever before and while it may mean more work for sponsors, this may not be such a bad thing for brands looking to build deeper relationships with increasingly targeted demographics.